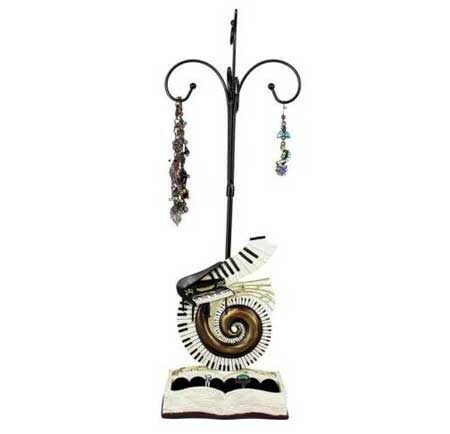 Piano Jewelry Stand – Put your jewelry on display in your home with this gorgeous stand! Expertly crafted from polyresin, the stand has a beautifully sculpted piano and music notes themed motif that is hand-painted. You can hang your favorite earrings, bracelets and necklaces from the curved hooks while storing multiple rings at the base. Any fashionable piano lover with a fondness for jewelry will enjoy this unique gift. Some assembly required. Size: 2.5″ x 4″ x 12″.